Baby is a bit of Houdini and I am a rubbish swaddler. I need all the help I can get. I've found that the swaddle fabric is the most important part of a perfect swaddle, after the technique itself. The key is to get baby really tightly wrapped - even if it feels like brutality to keep pulling on the fabric until baby shrinks to half his body size. 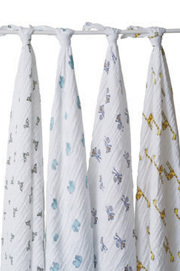 The best swaddle fabric I've found is by Aden and Anais. It's a thin (perfect for summer) muslin and has stretch to it. Plus, they have really fun (but not Disney) prints. They come in very handy to wipe up baby messes, and I've also used mine as a lightweight blanket when it's too warm for a onesie but baby is feeling shy. They're priced at the high end, but I think they're worth every penny.